"Save as ..." ignores the location of the current file and ignores the last save location. 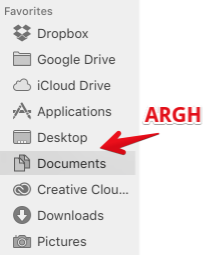 This means I have to navigate back to the original files source folder every time I want to save a different version of the file in Excel. Many apps do this. Years ago a utility was released called DefaultFolderX. It lets you fix this problem for all apps, and it can even store two different locations- one for opening files, one for saving files. It’s excellent for when you open files from one directory, work on them and save them into another directory. It is unlikely that Microsoft will do anything about this function as they would regard it as the operating system’s responsibility. There are also separate uservoice sites for the individual Office applications. Make a feature request. People vote for it. Microsoft uses these votes to prioritize which features to implement. Not the answer you're looking for? Browse other questions tagged macos finder ms-office office-365 . How to make Finder show icon thumbnail for some Excel documents? How can I change the default save location of Office for Mac? How can I control the default save location for PDFs in Microsoft Word for Mac? Microsoft Office 2011 no longer working with Yosemite 10.10.2?